Shoes of the Danube is beautifully poignant. Photo: Bella Jewell. A few hundred metres away from the imposing Hungarian Parliament building, lingering on the edge of the vast Danube river, one comes across a small but powerful monument to the massacred Jews of Hungary. On the concrete bank of the river, on the Pest side of the Hungarian Capital, lies a long trail of cast iron shoes. Their apparent emptiness immediately lends a sinister tone to the simple sculpture; their presence implies a painful absence which is all too real. These iron shoes honour the Jews who were killed by the fascist Arrow Cross militia in Budapest during World War II. The monument was realised in April 2005 by Hungarian-Turkish film director, Can Togay, and sculptor Gyula Pauer. The sixty pairs of iron shoes creep cautiously towards the edge of the east side of the Danube, representing the horrific execution of Jews between December 1944 and January 1945. Members of the Arrow Cross Party police escorted up to 20,000 Jews from the Budapest ghetto and shot them into the river, for the current to take their bodies away. In the humiliating and dehumanising fashion that characterised the antisemitism of the period, victims were forced to step out of their shoes before being shot by the Arrow Cross brigade; yet another example of the sadistic resourcefulness of the European fascist regimes. The shoes, which replicate those of the 1940s, are diverse in style, gender, and occupant. One can find the tiny buckle-up shoes of a child, the neat business brogues of a male professional, the pretty laced heels of a young woman. The diversity highlights the indiscriminate cruelty perpetuated by the fascist regime. No matter your age, gender, or occupation, being Jewish was enough of a death sentence. What is striking is the individuality of each pair, rendering each shoe a tragedy in itself; Pauer has incorporated the history of the owner into their shoes, through the shape, where it is worn, and the imprint of the heel on the sole. By the 20th Century, the Jewish community had grown to constitute 5% of Hungary’s total population and 23% of the population of the capital, Budapest. However, despite the long history of Jews living in Hungary, by the interwar period anti-Jewish policies were becoming more repressive. It is estimated that by the end of world war two, 560,000 out of 825,000 Jews had been murdered as part of the Holocaust and actions perpetrated by the Hungarian government. Antisemitism, however, has reappeared in Hungarian political discourse in recent years. This sentiment has manifested itself in the openly antisemitic, anti-Roma party Jobbik, which took 17% of the vote in the 2010 national elections. More recently Budapest has seen protests against a state-commissioned monument in Freedom Square. The composition of the statue seems to imply that Hungary’s involvement in antisemitic and anti-Roma actions were orchestrated by Germany, reducing Hungary’s culpability in the Holocaust. The row over this monument highlights one of many attempts of the far-right to re-write history to arouse national pride. 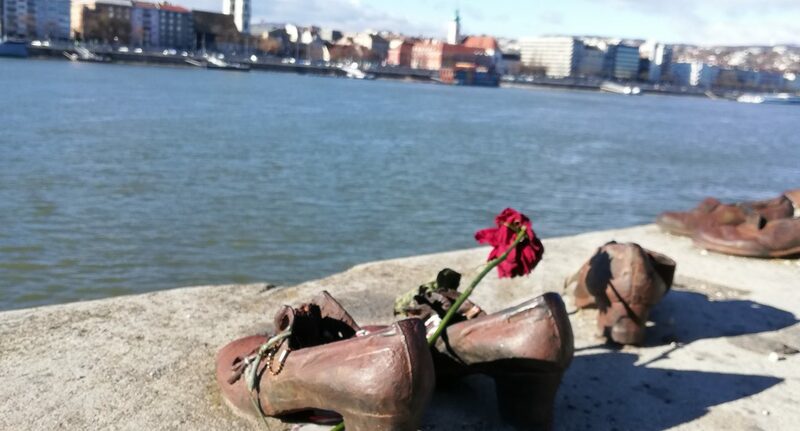 Shoes on the Danube Bank is a quiet reminder of a violent and oppressive past. These small, iron shoes humanise a gruesome statistic, drawing attention to the limitless cruelty of the Arrow Cross Party.